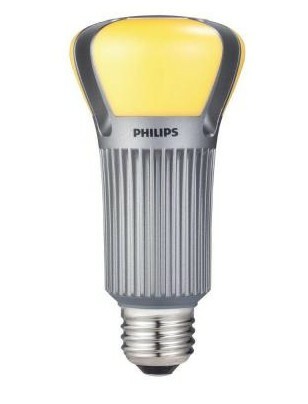 Home Depot are now stocking the 75W equivalent Philips AmbientLED 17W lamp. It provides 1100 lm. I'll check a local store. For now it may be web-only. Shopping for the right size water meter key sent me to both Lowe's and Home Depot this week. As you might expect I ventured down the LED lamp aisle. Lowe's has dropped the price on the GE 62180 (LED9A19/830/TP) and many of the Feit A-series by $10. The GE 62180 is now $29.95 as well as the Feit "40W" A-19s. (LA19DIM80LED) Both are excellent lamps. For general illumination, the GE 62180 is clearly one of the best lamps. The 3000K temp of these light a room very well if you use 4 of them. It's also pretty in table lamps. I use them in non-dim overheads (requires 4), hall lighting, front porch and a few table lamps. The Philips A-19s also look fantastic in table lamps. The 2700K temp of these is a little yellowish in overhead lighting but quite nice seen through a shade. Table lamps are about the only place I like these due to their color temp. This may be due to our choice of wall color (white with a hint of grey) and not the lamps themselves. I'm going to be picking up a couple more of the Feit 800 lumen (LA19DIM/800/LED) "60W" A-19s for the workbench and moving the "40W" Sylvania - which worked great - to another location. The Sylvania made laser-marked IC part numbers literally pop off the part. My only reason for moving them is to pickup a little brightness. The dimmable Feit LA19DIM/800/LED "60W" A19 lamps that I've been using in the office are working out great. This is in a quad socket fixture. For an overhead application it boils down to four of the GE62180 for non dim or four of the Feit LA19DIM/800/LED "60W" lamps when dimming is required. For directional lighting the Sylvania PAR and MR-16 LED lamps are still my favorite. The PAR clusters make the white Austin Stone chimney light up. The PAR down lights mounted in a bare socket have really grown on me. The Utilitech (Lowe's) 18" and 21" dimmable under cabinet task lights work great. I almost always keep them on full dim. I don't use the Utilitech non-dim 27" task light above the sink. The Utilitech 27" is bright and clean which is the problem: You need shades to have that one on. When winter comes and I need the light I'm sure I'll use it more. When the budget allows I'll put some of the 27" lights in the original proscenium located in the den. It originally had flourescents and I remember that it looked pretty cool as a kid. Thanks for keeping us appraised, it can be expensive to be an early adopter. Have you been messing with this long enough to suffer any failures? I have noticed that some of these new improved lamps are sensitive to environmental temperature and perhaps vibration (like inside a glass globe, attached to a ceiling fan). I have dropped the wattage way down and survival seems better, so I am betting on temperature over vibration, I miss the brightness of incandescent bulbs, but don't miss the short lifetime that we used to accept. I haven't experienced any failures to date. I bought and have been using the Sylvania PARs since January 2011. I don't have any in a high-vibration environment. Probably the most difficult environment for two of my lamps have been the front porch - a GE 62180 - during the recent 70 continuous days of >100 degree heat. I'd often forget to turn it off during the day and it was running on some days with a 110 degree ambient. The Sylvania "40W" LED also did some time out there before the GE. What's really surprising are the few CFLs I use. One of those has been burning continuously in the attic for two summers now. I didn't measure it this summer but I expect the ambient up there, when it's 110 outside, to be at least 120-130 degrees. I also have two GE PAR CFLs for outdoor floods. Though I eventually want to use the Sylvania LED floods, I'm waiting to mod them until I pull down the fixtures to re-paint them. Combined the two CFLs pull 46W so I'm in no hurry. They usually burn at night and during the heat wave the daily low temp was typically 90 degrees. It's just been too hot for me to work. I wanted to share some Smart Meter Usage data with all of you. You can see that our heatwave broke around September 5th. Yesterday, September 24, 2011, it was only 97 degrees for the high. It also rained once in the last three months. The Atomic Ranch has about 1835 square feet of living area. As you might expect the bulk of the summer load is Air Conditioning. The compressor pulls about 13.6A. I haven't measured it in awhile but IIRC the blower pulls just under 3A. At 5 O'clock on a 100+ degree day with the air conditioner running continuously, normal lighting and static loads, three computers I'm seeing current draws of 25 and 20 Amps/leg. About 5400 VA.
What is the power factor of the Atomic Ranch? About the same as any other residence with an Air Conditioner. I'm estimating the power factor with the AC running to be about 0.74. What is the phase angle? Well, the load is inductive being mostly the AC compressor, blower, refrigerators, etc. so current will be lagging. Based on a estimated PF of 0.74 the phase angle is -42 degrees. Once the heat wave ended we could see the static load of the atomic ranch in the Smart Meter data. You can see the toaster oven or main oven get turned on around 6:30 PM. From about 8 PM until 7 AM a single Tungsten security light burns along with several CFLs and dimmed LEDs. When the security light gets turned off around 7 AM the house consumes approximately 800 W/h. Not bad considering I'm here working. Now that air conditioning is not running continuously I'll check the lighting load. The last time I checked, with the living areas fully lit and with closets fully lit, the total lighting load was <6A. The poor capacitive power factor of some CFLs (and possibly some LEDs) may not be that great a concern when compared to the load current and power factor of the air conditioner compressor. The load data suggests that LED (or a mixture of LED and CFL) lighting is a quite small percentage of the total load. At the Atomic Ranch, the load current ratio is about 3:1 air conditioning over lighting with every light turned on. 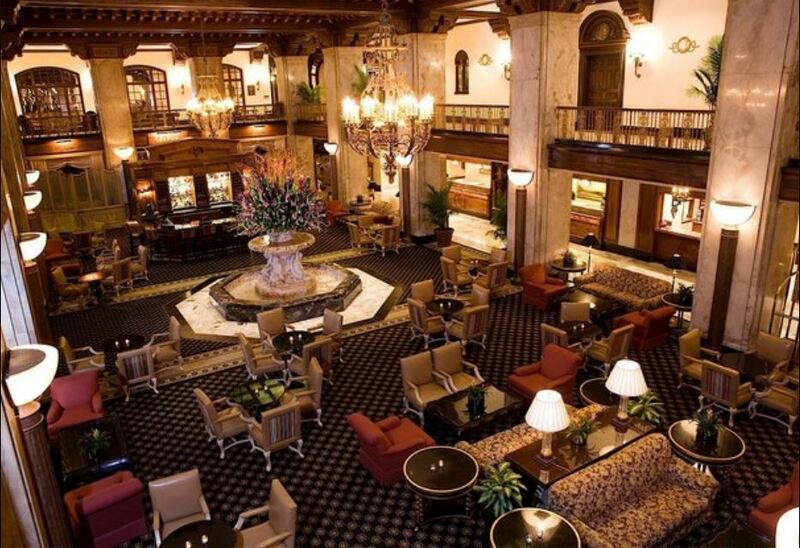 Dimmable LED products typically are unity power factor and want to appear resistive to the dimmer. I decided to use to replace a pair of outdoor CFL floods with some new Sylvania 1100 lumen LEDs. I've been using the Sylvania PAR30, PAR38 and MR16 LED lamps indoors for a number of months now with great results. All produce clean, 3000K light and dim well with a wide variety of dimmers. I decided to replace a couple of outdoor CFL par-series with the Sylvania LED21PAR38/DIM/930/FL30/HVP offered here as Lowe's SKU 352309. The GE FLE26/2/PAR38/XL is a 1300 lumen CFL "warm white" that has been in service for almost two years now. My only real complain about the GE is slow warm-up time and low output when very cold. When you turn on the GE, be prepared to wait about 3-5 minutes for useful light even on a warm day. 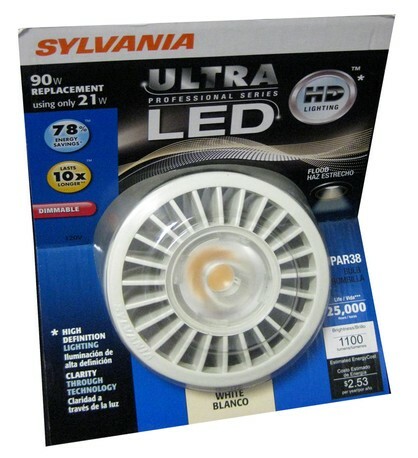 Now that the Sylvania LED21PAR38/DIM/930/FL30/HVP LED is offered in 1100 lumens I decided to give it a try. Wow. The light is stunning and of course there's instant turn-on. The GE CFL was a 40 degree beamwidth, the Sylvania LED21PAR38 "FL30" is 30 degree. The LED appears visually much, much brighter and the 3000K color temp makes the colors in the view of our woods just "pop." The LED21PAR38 does dim. Operation on a variable AC voltage Variac begins with a mild "pop-on" at about 30 volts rms. Using it with MLV (magnetic low voltage) dimmers I doubt this will be an issue. It hasn't been with the other Sylvania PARS. This lamp also works on DC. Measured consumption at 120V was 30VA. I suspect the 21W figure reflects the lamp's power factor. At 60V, with lots of light still being produced, this lamp drew only about 1.2W. What I have in my bench Luxo lamps are the Sylvania LED8A/DIM/830. Those are "40W" 3000K. I find the color or quasi-point source nature of these make laser-marked part numbers "pop." THAT and ADI SMT were some of the hardest to read. No.. now I must make them work.. I found in one case I had to replace a small x4 resistor array, that just wouldn't make connection. After removing it I found what looks like one bottom pad on the part, mostly gone??? I hope that isn't going to happen in production. Nothing I did to AFAIK. I had to go out in the direct sunlight to see and read the mrtking on some small parts. One of the two boards I built up, powered and runs good enough to check out the design with, but I wanted both to fire up and run. btw thanx for the tips... I bought a cheapo fluorescent under counter light, and the sucker already blew it's oddball tube. I had to go out in the direct sunlight to see and read the marking on some small parts. I had trouble reading an ADI part number once and Ros, a colleague, was on the phone and suggested that I smear some spit on it for contrast. It worked. I think I went outside that day too. I think the spectral output on LED lights are cleaner than fluorescent. If you look at a fluorescent light's spectral lines it's pretty dirty. There's just something about the purity of the LED light that makes colors pop and SMT part numbers have more contrast. We have a relatively new Target nearby where the freezer cases are lit with LED lights almost like the linking bars I showed earlier. The product labels almost look 3D. The ink jumps off the box. What's also weird though is that the cases have auto-turnoff. As you push your cart through the aisle they turn on one-by-one. With the low power consumption they already experience I'm not sure they save much. They're relay-operated too which is a real hoot. The time-out is short. Let's see how long they last.